1 pc. 19,92 EUR ea. from 3 pcs. 17,87 EUR ea. from 10 pcs. 16,04 EUR ea. from 20 pcs. 15,15 EUR ea. from 40 pcs. 14,36 EUR ea. Ask for a rebate from 160 pcs. 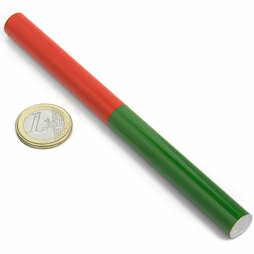 The long AlNiCo rod is 12 mm x 150 mm long and red-green coated. The poles lie on the small circular areas, the north pole is located on the red end. 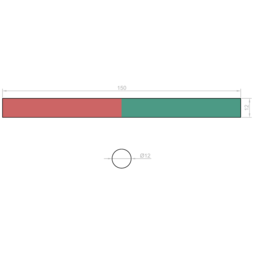 This magnet is suitable to demonstrate the magnetic field of an oblong magnet. Almost all magnets on our website are made of NdFeB (neodymium iron boron). These school magnets with their coloured poles are of a different material however, AlNiCo (aluminium nickel cobalt as well as iron). AlNiCo is suitable for educational purposes because it is less brittle and therefore less breakable. However, AlNiCo is approx. 8 times weaker than NdFeB, but still much stronger than a ferrite magnet (=refrigerator magnet). 1 pc. 37,64 EUR ea. 1 pc. 7,57 EUR ea. 1 pc. 16,34 EUR ea. 1 pc. 22,00 EUR ea. 1 pc. 25,17 EUR ea. 1 pc. 16,17 EUR ea. 1 pc. 25,78 EUR ea. 1 pc. 7,70 EUR ea. 1 pc. 7,10 EUR ea. 1 pc. 18,79 EUR ea. 1 pc. 8,32 EUR ea. That's how the magnetic field of oblong bars and rods looks like. Iron filings are well suited to visualize magnetic fields. We thank Bram Spaan, photo artist from the Netherlands, for these great photos with different AlNiCo magnets (www.bramspaan.com).